All the major stats and numbers during the 3rd day which was dominated by India. 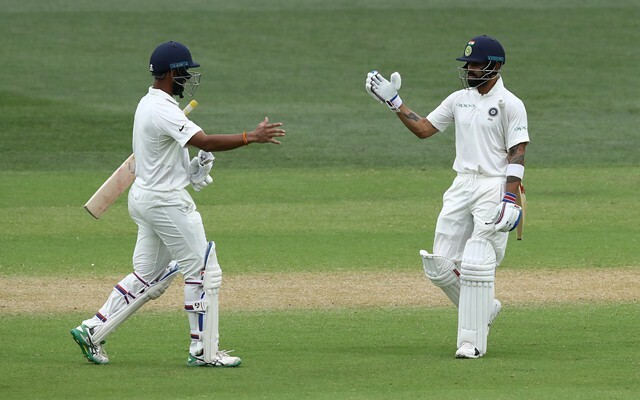 India tightened the grip on the Adelaide Test match after a decent batting display on the 3rd day of the game to extend their lead to 166 runs. Contributions from India’s top four helped them end the day at 151/3 which could have been even better if skipper Virat Kohli did not get out in the last moments. The rain-affected day opened with Australia getting bowled out for 235 after adding 46 crucial runs for their last three wickets. 6 – Number of catches Rishabh Pant took in Australia’s first innings. These are the joint-most number of catches in a Test innings for an Indian wicketkeeper. MS Dhoni also claimed six catches in New Zealand’s first innings during the 2009 Wellington Test. 18 – Innings Virat Kohli needed to complete 1000 Test runs in Australia. He is the quickest to this milestone among Indian players and the joint 5th fastest among visiting player. 6 – Nathan Lyon has dismissed Kohli on six occasions in Test cricket which is the most by any bowler. Kohli has been dismissed by James Anderson and Stuart Broad on five occasions each in this format. 9.16 – Murali Vijay has a batting average of 9.16 in Test cricket since his century against Afghanistan at home. Vijay has aggregated 55 runs in the six innings since that knock. 11.86 – Virat Kohli’s batting average in the last seven Test innings against Australia. His scores in these seven innings read 34, 3, 6, 15, 12, 13 and 0. 8 – As many as eight players claimed multiple wickets in the first innings from both the sides in this game (4 Indians, 4 Australians). This is only the 18th Test match and the 4th in Australia where eight players have taken more than one wicket in the first two innings of a Test match. 63 – The 63-run partnership between KL Rahul and Murali Vijay is the highest opening stand for India in Australia since the 123-run stand between Virender Sehwag and Aakash Chopra in the 2004 Sydney Test match. Rahul-Vijay pair is also the first Indian opening pair to bat for 20+ overs (2.0 in 1st innings and 18.2 in the 2nd) in a Test match in Australia since the 2003/04 tour. 2008 – For the first time since 2008, India took a first-innings lead in a Test match in Australia. The last was in the Perth Test match in the 2007/08 tour which was the last time India won a Test match in this part of the world. Since then, the Aussies took the first-innings lead in nine consecutive games they played at home against India.